The Get Down Rope with tassel can be used in two ways. Either tie the tassel end through the loops of the fiador knot and loop the popper end to tuck into your belt or tie to the saddle. Leave enough length between the part tied to the halter and the saddle, or tucked into your belt, to allow full sideways flexion of the head. Or it can be used by threading the tassel end through the back of a bosal or loosely fitting bridle noseband. It is then taken up around behind the ears and tied around the neck with the tassel hanging down. There should be a gap of two hand widths between the rope and neck. The popper end is then brought round and looped to a tie or mecate rein holder on the saddle or can be tucked into your belt. If tucking into your belt tuck it upwards from bottom to top for safety reasons. 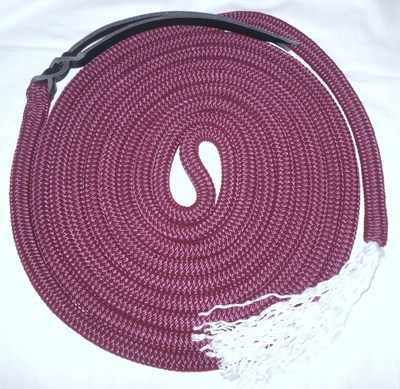 The Get Down Rope allows you to dismount and have a rope to lead the horse without having to use the reins. Working on the same principle as the 22ft mecate reins, which form reins and 12ft rope combined, the Get Down Rope allows you to use separate reins and also a bitted bridle.